The Hercules Cluster (Abell 2151) is a cluster of about 100 galaxies some 650 million light-years distant in the constellation Hercules. 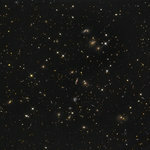 It is rich in spiral galaxies and shows many interacting galaxies. The cluster is part of the larger Hercules Supercluster, which is itself part of the much larger Great Wall super-structure.